eT-Kernel : Optimized and enhanced version of T-Kernel. eMCOS real-time operating system that provides scalable support from microcontrollers through to single core and heterogeneous multi- and many-core systems. 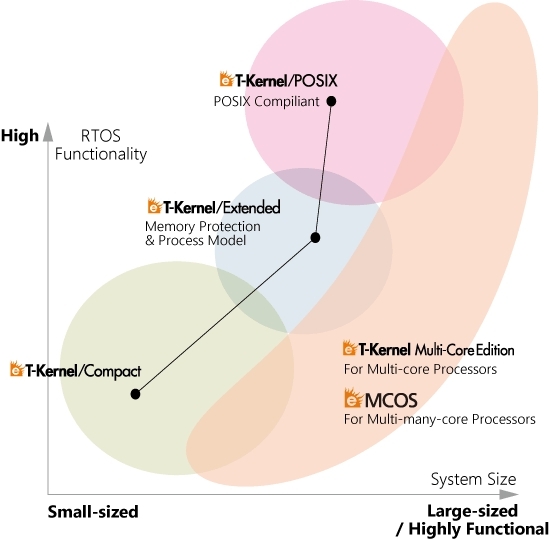 Because of its scalability, eT-Kernel provides multiple profiles, including a µITRON-like compact kernel, a large operating system based on the memory-protected process model, plus a profile with the POSIX specification. Additionally, we offer eT-Kernel for homogeneous multicore processors with an advanced scheduling mechanism to allow the coexistence of both SMP and AMP, giving you a good migration strategy path from your single core based legacy code.